Two of my children have had surgery thus far in life. It is always a scary thing–surgery. While most of the time things go right, sometimes things go wrong and that can be nerve wracking. I think it is helpful to prepare yourself and your family ahead of time and to know what to do to help make the whole process easier. 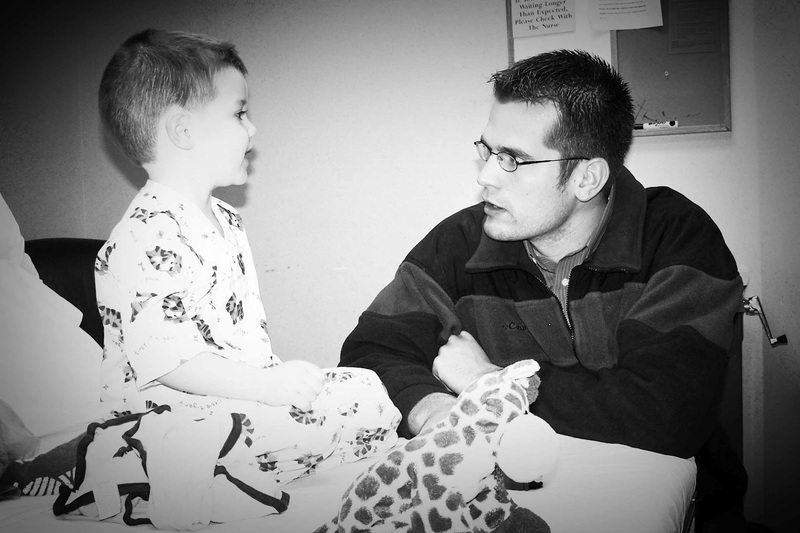 With Brayden, I had months to research and prepare for his sugery. He had what is called “trigger finger” in his thumb, which meant his ligament was preventing him from extending his thumb fully. His proceedure was rather simple. I was able to talk to moms whose children had been through surgery and get their wealth of knowledge and experience before facing it. With McKenna, however, I had less than 24 hours notice before her surgery, and a proceedure was added during surgery, giving me no time to prepare. Her initial surgery was for ear tubes, which is very simple, but she also had an adenoidectomy and a tonsillectomy added at the last moment. The tonsillectomy is not quite so easy and low impact. Because of the short time frame I had with McKenna, I thought a post on this blog with genearl tips on prepping for surgery would be helpful for anyone of you whose child needs to have surgery. Ask Questions: As your doctor, ask your friends, neighbors–anyone you can get in contact with for their experience and what things you should be asking. A hard thing with surgery is we often don’t know what we should know. People who have been there can help us out with that. Research: Do your own research on the procedure. Don’t just rely on what the surgeon is telling you pre-op. Again, ask people about their experience. What should you expect pre-op and post-op? Ask on social networking sites, read reputable websites, read journal articles….find out what you can. Stock Up at Home:: Buy what you will need before the surgery. Buy foods, medicines, humidifiers, etc. all beforehand so you have it at home. Going shopping with a child who just had surgery is even less fun than with a healthy child. Waiting at home while your spouse runs to the store for needed supplies is also not fun if the child is in need of it. Many surgeons will even call in prescriptions the day before surgery so you can have that at home, also. Talk to Your Child: Explain in a way that you think is best for your child. Why is she having surgery? We told McKenna she was having surgery so her ears wouldn’t always be in such pain. She had been living with pain in her ears for long enough that this was very exciting for her. Tell the child what you will do (though I don’t think I would tell what the surgeon would do). “we will get up early and then go to the hospital. We will put you in a special outfit. You will go with the anesthesiologist…etc.” This is training in times of non-conflict. Tell your child enough to give her the tools and power of knowing what is going on without so much it scares her. Easy to change clothes: your chilld will most likely be changed into a gown for the operation and then back into her clothes before going home. You will want these to be easy to change. Sippy cup/bottle: I would bring your child’s own cup to the surgery. After surgery, your child will need to drink so much liquid before leaving, and it will be easiest to do this with a child coming off of anesthesia if she has her own cup she likes to drink from. Camera: Capture the day on film. Blanket: Bring along your child’s favorite blanket (or just a familiar blanket if she doesn’t have a favorite). Lovey: We brought a favorite stuffed animal. We did our surgeries at two different hospitals, and both allowed the child to take a stuffed animal (or several) into the operating room. McKenna chose not to take one into the OR, but Brayden brought his. They even bandaged his giraffe up just like him. Other entertaining items: We brought some toy trains for Brayden. For McKenna, we had Elmo on my husband’s iPhone that we turned on after the surgery when she was waking up. It helped her to be a little more calm. Be comfortable: Make your child as comfortable as needed. For Brayden’s surgery, he was able to go about his day as usual, just with a large bandage on one hand. McKenna, however, was down for the day. She was on the couch all day and her menu was significantly different. I made her very comfortable on the couch, and myself very comfortable on the other couch. Be present: After anesthesia, you need to watch for blood clots. Because of this, I didn’t even take McKenna to her room for a nap. I stayed right by her side the whole day so I could watch her. I really worried about the no food and water after X time thing–especially in the morning. Both of these children are big eaters who want to eat as soon as they wake up. There really isn’t need for worrying. Niether of my children asked for food nor water. Both hospitals we went to were great and had us scheduled first thing in the morning, so we had to wake the child up to go to the hospital. That definitely made it easier to go without food and water. Once at the hospital, things are so new and they are just nervous enough they don’t think about it. Some hospitals will allow you to take your child to the operating room and stay until the child is asleep. Others take the child at a certain spot. Both hospitals we went to take the child. With Brayden, they carried him and he cried for about 10 seconds, and then was okay. With McKenna, she walked out hand and hand with the anesthesiologist chattering away. We knew what was going to happen and had better prepared her for what was to come, so she was okay with it. Some children are “angry” when coming off of anesthesia. Pretty much all children cry (if not completely all). Some are just angry. That is Brayden. He was angry while waking up. It is definitely easier to have just a sad waker (like McKenna) than an angry one. The child doesn’t stay angry for long and doesn’t remember it later. Don’t be worried about things getting off the normal routine. The child will bounce right back into routine happily once she has recuperated. Some children have a hard time with doctors or dentists after a surgery. Brayden was fine with his doctor, but the dentist freaked him out for the next year. He had previously not be scared at the dentist, but having to lay down and open his mouth and have a person with a surgical mask lean over him really scared him. He did get over it, but it was sad to see. It remains to be seen if McKenna will have the same reaction with the dentist. The doctor is fine. If you have any tips for preparing for, going to, or after the surgery, please share! Next Post Poll Results: WHAT WAS BABY’S INDEPENDENT PLAYTIME LENGTH FOR 10-11 MONTHS OLD? The timing for this post is amazing. In two weeks my son has surgery because he's tongue tied. This gives me a better idea as to how to not just prepare him but myself as well. Thanks! My daughter has surgery this Thursday. Thank-you for your insights-some very helpful things that I had not thought of. Thanks for the encouragement. I am and otolaryngologist (ENT) and a mom of two who LOVES your babywise blog. I totally and wholeheartedly agree with everything in this post. The best way to approach any surgery is to be prepared, and that makes life easier on you and your child. Make sure when you read on the Internet, though, that it is from reputable sources, otherwise you'll get unnecessarily worried. Good websites are WebMD, any of the American Board of _____ (for whatever specialty it pertains to) or physician offices websites. Thanks for all you do for all us moms out there! I wouldn't have survived without your blog these last couple of years! And sometimes, there's no opportunity to prepare. You take your child to the ER with breathing difficulties from a cold and end up having half a lung removed 12 hours later. In those situations, stay calm and level-headed, so that emergency personnel can focus on your child instead of you. The EMTs who flew my son and I out of town for surgery actually congratulated me on this, but I was just on autopilot, trying to do the best thing for my baby. 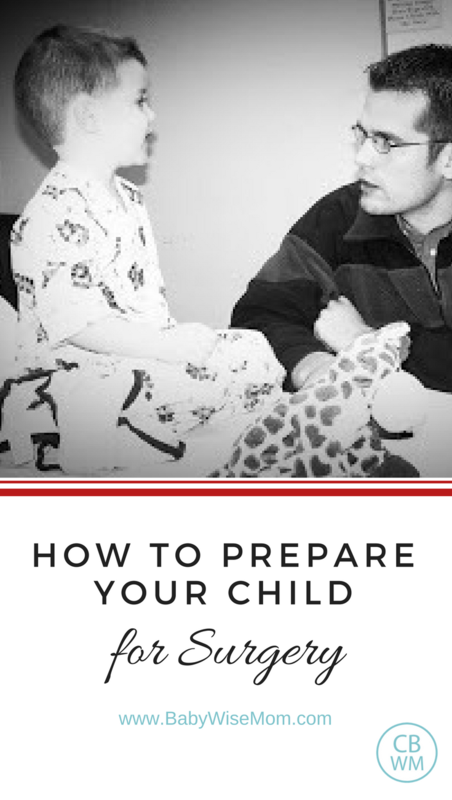 Our child wasn't quite 6 weeks old, so there was no need to prepare him for any of it, but we did explain things to his 2 year old sister in a very basic way. Essentially, she was told that her little brother was at the hospital because he was very sick and that the doctors were making him all better. She would have fun staying with family while we lived at the hospital. From a breastfeeding angle, I have some very practical tips on making breastfeeding work in a situation where your child is having major surgery. They're on my blog: http://mamagab.blogspot.com/2011/08/nursing-through-major-illness-wbw-post.html Our baby was unable to eat for 5 days after surgery, so he was on a feeding tube, and it would be a week before he was nursing. Still, he never had formula and eventually, we went back to a great nursing relationship. I agree with everything you said. Great post!I'm a nurse anesthetist, so I can offer a couple of things from that perspective. Generally, people in my line of work who do pediatric anesthesia do it because they love working with kids. We do our best to establish a rapport with you and your child from the moment we walk through the door. As an above poster mentioned, make it about your child, not about you. If you act calm and happy to see us, chances are that your child while respond likewise. Of course you want questions answered etc. which your anesthesia provider should be happy to do, just be calm and friendly about it. It seems like common sense, but I think that as moms we are somehow wired to be defensive (that's a good thing! ), and this can really impact the child's attitude. Some children, and some ages are more prone to wake up angry as you said, but (and this is true of everyone, adults and kids) going to sleep happy gives you a much better chance of waking up happy :)I hope that might help someone a little bit. I am so thankful for all the work you do on this blog and I'm glad to lend what expertise I have on this topic. Thank you to all who left their own advice! My son has trigger thumb and we decided not to have surgery. Is there a reason you decided to do it? Rachel,There were a few reasons. One is Brayden was at the age when it wasn't statistically likely it would correct itself. If your son is young(1-2), there is still chance it will correct itself. We first saw Brayden's when he was barely three, then we watched it for about 9 months before deciding to go for surgery. So it wasn't a decision we came to lightly.It was on his dominant hand and if it wasn't corrected, it would have interfered with simple skills like scissors and handwriting. It also would have interfered with piano and sports. So we did it so he could have full function of his thumb. Glad to have helped Wimberley! I am glad it went well.